PDi recently revisited Hilti headquarters in Schaan, Liechtenstein. Editor-in-chief, Jan Hermansson reports. 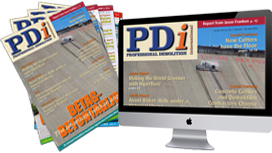 Since PDi’s last visit almost the entire headquarter premises has being remodelled, including a 30,000m2 innovations centre, which was opened at the end of May 2015. The Innovation Centre, housing all units and functions involved in research and development, has around 400 employees. The centre emphasises its long-term commitment to progress and cutting-edge technologies. In addition to the development area, the centre houses a cafeteria, a number of relaxation rooms, fitness centre and a room for worship. Close to the innovation centre Hilti also recently opened its Hilti Child Care Centre for its employees’ small children. Hilti entered the professional concrete sawing and drilling industry in 1982. Ten years later they acquired Swedish manufacturer Gearmec. In 2005 the company introduced its Hilti Fleet Management programme whereby contractors rent or lease everything from Hilti. A Fleet Management contract runs up to fours years. When the contract ends the contractor can either purchase the equipment or sign up for a new period. By renewing contractors always work with the latest equipment and tools. If a machine breaks down the contactor will get a replacement machine and tools as standby if needed. Swiss contractors favour Fleet Management and are also becoming very popular in Germany where at least 70% of the Hilti users opt for Fleet Management. In Scandinavia about 30% to 40% of the users prefer the system. Hilti Fleet Management is soon to be launched in the US. “Most of our clients see Hilti Fleet Management as an insurance,” said Hilti Diamond Sawing Systems product manager Hans-Jörg Rieger. One of the driving forces for Hilti when developing new machines and tools for concrete cutting is to make things easy for operators. One good example is Hilti’s high frequency equipment that has few components. Compared to other manufacturers the electric converter is integrated in the sawing or drilling unit instead of in a box connected with a cable. One of Hilti’s latest developments is the core drilling system Hilti DD 350-CA with the new auto feed device DD AF-CA. This is the first core drilling system with the Cut Assist concept launched mid of 2015. After the core drill system has been mounted it completes the drilling procedure on its own. It carefully establishes the first millimetres of the drilling, before accelerating and sensing for rebar, increasing torque, and signalling the tension to the operator. When through the rebar the system speeds up and stops automatically when the drilling is complete. The system is watercooled and spash water protected and there is no need for air-cooling of the drill motor. According to Hans-Jörg Rieger the Cut Assist concept increase operators’ working time by up to 40% compared to manual drilling. There are no buttons on the new Hilti auto feed, only an emergency stop. Another advantage is the HF converter being integrated in the drill motor with just a short cable between the auto feed unit and the drill motor. “There is currently a lot of talk about increasing the cutting speed and efficiency. But with fast diamond tools there is very little time to be gained. Therefore for us time and efficiency can be gained on other things like the Cut Assist system,” said Rieger. Hilti has also developed a solution to simplify the retipping procedure and to save steel tubes and minimize weight in the concrete cutters’ vans. This solution was first developed for small diameters of core bits but is now available for core bits up to202 mm in diameter. The end of the core bit, where the diamond segments are attached, can be removed and replaced. It is basically a diamond exchange module comprising a small ring that can be easily replaced with a bayonet mount. During the tour of the production area Martin Gödickemeier advised that about 50% of production concerns Hilti’s fastening equipment. The other half is divided between electric tools and equipment and diamond tools. About 50% of the market is in Europe. Hilti has about 22,000 employees in 120 countries, where about 15,000 work in direct sales through subsidiaries mostly owned by Hilti. There are very few independent dealers. Hilti is an international company as more then 60 nationalities work in the head office, which has about 2,000 employees. There are About 2,500 employees in North America. 2011 was a quite difficult year, but since then Hilti growth has increased and last year by 3.6% to reach a turn over of €4.1bn. Hilti had a return on sales of 11.9% in 2014. About 45% of profit is reinvested in research and development. Hilti has significantly increased its spendings for R&D, by 18% alone in 2014 and again significantly in 2015. Hilti currently has production in Liechtenstein, Switzerland, Austria, and USA and in a plant in India with over 500 employees. But the core technology will stay in Liechtenstein and Switzerland. Each year about four million diamond segments are produced in Schaan. The majority of these have the Equidist diamond system that radically improves the cutting performance and life of the segment. The Equidist diamond system was launched in 2009. Production of Equidist segments will also take place at the plants in India and Los Angeles, USA in the near future. The DS TS5-E was the first wall saw from Hilti with integrated converter or like Hilti calls it, with E-box. “It was a difficult task for our R&D department to fit the E-box inside the saw housing. We actually started this development in1996 and have refined the technology over the past 20 years, so that it is now possible to produce even very powerful machines without external e-box.. Another hard nut to crack was to integrate the E-box in our drilling system DD 350. But it worked and we are very proud of this unique solution,” said Gödickemeier. “We have solved a lot of problems and breakdown situations with the integrated E-box, as it is in the cable between a separate E-box and the wall saw where most failures occur.” The goal is to integrate the E-box in the largest Hilti wall saw DS TS20-E.
Hilti Executive Vice President Business Unit Diamond Systems Johannes Wilfred Huber shares his thoughts about the current market situation and the future for Hilti concrete sawing and drilling systems. Hilti has repeatedly won prizes in recent years for being one of the best companies to work for in several countries. “If our employees are happy with what they are doing and like their job they are also giving our clients a great service. I think that concrete cutters are more demanding today. They know what they expect from the tools and equipment they buy and they also ask us, the suppliers, for a very high level of commitment to them. Hence, having a strong and passionate team is key for us to fulfil our customers’ high expectations,” said Huber. Hilti has a strong foothold in most of the big markets in Europe. Even the south of Europe is picking up slowly after years of recession. Huber believes that even if Hilti has a very strong foothold in several of the European countries there is still room to increase its market share. “How we see it is we are presenting solutions to contractors that our competitors do not offer. Simplicity, efficiency and increased profit for the users are our keywords. And we have worked and are working hard to develop products and services that accomplish that. More and more users are becoming aware of the advantages of our innovative products and complete service packages like the Fleet Management Programme and the Cut Assist System,” said Huber. For Hilti organic growth is a priority and not through acquisitions. Key growth drivers like innovation, or diversity are best built organically then through acquisitions. Huber thinks that in the future those manufacturers that have done their homework will succeed. The future will be more demanding with customer relations, products, diamond tools and service. “And Hilti’s service programme is a key strength, especially since Hilti is performing all repairs in its own repair centres,” said Huber. No repair should take any more then three days. “One day for transport to a repair centre, one day of repair and one day transportation back to the customer. And while the customer is waiting we will lend a replacement in many countries,” said Huber. Huber stresses the value of being a privately owned company, providing Hilti a strong culture and long-term orientation. Hilti is owned by the Hilti family trust, but the members of the Hilti family have a very strong impact on the company. Martin Hilti founded Hilti in 1941 and Hilti will be celebrating their 75th anniversary in 2016. The president of the Hilti trust is Martin Hilti’s son Michael Hilti.